Can Car Sharing Accelerate Electric Vehicle Adoption? Car sharing is its own movement within sustainability, but it could also be a boost to EVs. When it comes to sustainable, low-carbon personal transportation, electric vehicles and plug-in hybrids garner a lot of the headlines. But there are endless other options available these days outside of personal car ownership, when your two feet or pedals just aren’t enough to get around. The best-known U.S. example in the wide world of car sharing is Zipcar, which had an IPO last year and continues to extend its reach into cities and college campuses. Zipcar has been joined by some serious competition, like Hertz On Demand. But car sharing through large companies has more competition: the ever-expanding pool of peer-to-peer car sharing. For every car shared, ten to fourteen cars are taken off the road. It’s not just a cool concept for urban hipsters. The U.S. Department of Energy recorded a drop in ownership of four million vehicles in 2009, the first significant decline since recordkeeping began in 1960, according to research by Susan Shaheen at the Transportation Sustainability Research Center at the University of California, Berkeley. “We’re hoping if you know you can access a car in your neighborhood, people might round down the number of cars they own,” said Shelby Clark, founder and Chief Community Officer of RelayRides, the most extensive peer-to-peer car sharing network in the U.S.
That mentality might seem to be at odds with car makers, but quite the opposite is true. General Motors teamed up with RelayRides last year so that GM vehicle owners can leverage OnStar to rent out their cars through RelayRides if they choose to do so. And GM is not alone. Daimler, Ford, BMW, Toyota and Renault all have a partnership with a car-sharing service or are developing their own. Nearly all of the major car rental companies also have a car-sharing service. Hertz has On Demand, Enterprise recently acquired Mint and Avis introduced its On Location service for corporate clients last year. There are also a host of startups in the car-sharing space, including Wheelz, RentMyCar, Jolly Wheels, Getaround, I-Go, JustShareIt, and PATS Carshare, to name a few. And then there’s Boulder-based eGo CarShare, which specifically focuses on energy-efficient car sharing. With an ever-expanding pool of options to pick from, the largest companies, including Zipcar, are also looking at more efficient cars to add to their fleets. Electric vehicles seem to be the next wave, since many programs already offer everything from compacts to trucks to SUVs. Fleets in general are an attractive market for electric vehicles, because the cars are used in reliable patterns, but it is a little more complicated for car-sharing fleets, as the cars could be in use more often. Also, Zipcar does not always own the space where it parks cars, raising issues about installing charging infrastructure. Zipcar is exploring adding EVs to its fleet with a current pilot in Chicago, and Daimler has an all-electric car-sharing program in San Diego. Other car-sharing companies are taking on the taxi business, rather than car ownership. One of the newest entrants is Tickengo, which allows users to connect to give each other rides. Geoff Mathieux, CEO of Tickengo, said that the service is geared primarily to compete with taxis, rather than other car sharing services where customers drive the cars themselves and usually need to return it to the same location (or at least a prescribed one, such as with Hertz). “We’re not car sharing, we’re ride sharing,” he said. The most appealing use will be for getting to the airport, where those that need a ride can put in the time they want to go somewhere and the price they’re willing to pay (usually about half of what it would cost in a taxi) and someone in their neighborhood can offer to drive. Customers can search by cars in their area, gender of driver (e.g., if a female passenger only wants to ride with a female driver), and other parameters. The service, which comes with a mobile app, already has about 4,000 drivers nationwide and expects to have about 10,000 when it launches later this month. It’s still unclear whether people will want rides from strangers, but it’s entirely likely, based on the popularity of other car-sharing services through which people regularly lend their cars to strangers. RelayRides has expanded across the U.S. in two years and has “tens of thousands” of members, according to Clark, and several thousand cars. He said that RelayRides has an advantage of fleet car sharing, like Hertz or Zipcar, in that people in the suburbs can have access to other cars, whereas fleets generally only set up shop in densely populated areas. On average, cars on RelayRides earn about $250 per month, but some earn more than $1,000 per month. Although there weren’t statistics on what people are renting, Clark said that hybrids were some of the most rented vehicles and there is at least one customer that has some range anxiety about his Nissan Leaf, so he also owns a Volkswagen. The member, who lives in Los Angles, is able to offset some of the costs of his two cars by renting out his Volkswagen during the week when he takes his Leaf to work, and he can rent out his Leaf to EV curious drivers when he takes his Volkswagen out of town on weekend. 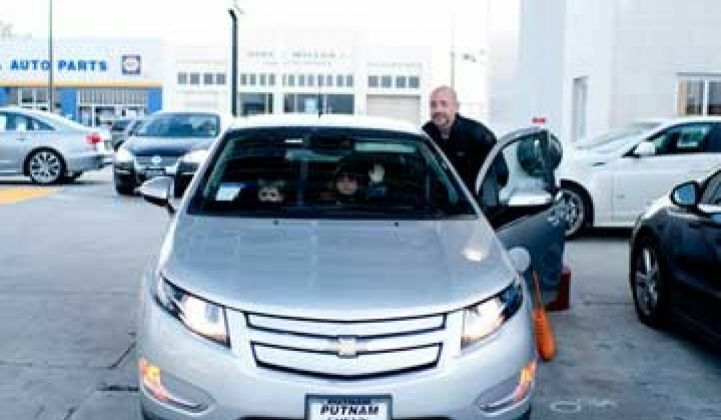 “By monetizing the spare car, we make it more possible for him to live the EV lifestyle,” said Clark.